Members of The Wonders have performed together and individually in the Dallas / Ft. Worth area for close to twenty years bringing with them a high level of musical energy and professionalism. These accomplished musicians and singers have performed throughout the nation for literally hundreds of special events including corporate events, reunions, golf tournaments, weddings, fund raisers and city festivals. Events include the Silver Spurs Ball fund raiser appearing with Kool and the Gang, the 45th Anniversary Waco Junior League Charity Ball with Three Dog Night, The Presidential Inaugural Ball in Washington and the Republican National Convention in New York City. The Wonders also played host to over 8500 attendees at the annual Dallas Margarita Ball held each year to raise donations of money and gifts for needy children during the holidays. 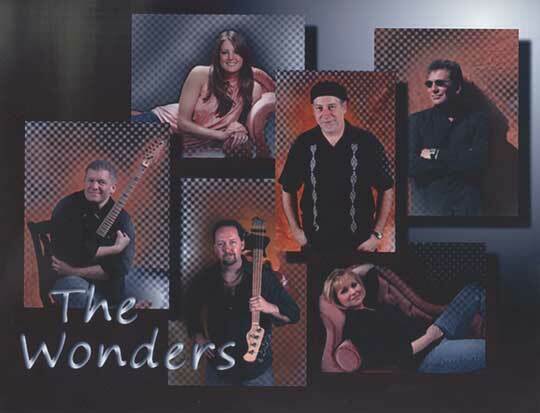 With a huge song list including standards, classic rock, 50's, 60's, and current pop favorites, the Wonders have just the right mix to keep your crowd dancing and entertained. Call or email for more information and to book your next special event with The Wonders. "Great music, great performers! Crowd was awed! "They were amazing - great band!" "The band was awesome! They were so personable and very easy to work with!" All Rights Reserved Carol Marks Music, Inc.